While the nation may be slowly changing their definitions of beauty, the label of being ‘a bigger, pretty girl’ can change how women feel about themselves. Permanently. In this brief but effective slam poem, Lauryn Lugo details how our world has come to view body image in pop culture and other ways of society alike. Have you ever been described by someone with a word that’s usually used to describe a milkshake…thick, thicker? Have you ever struggled with your body image? Have you struggled with thinking you are enough…just the way you are? You are definitely not alone. then if you struggle with accepting your body just the way it is, you are definitely not alone. In the last several decades, the beauty ideal in the media has increasingly become thinner. At the same time, cosmetic surgery and the dieting industry have become multi-billion dollar industries. It makes it so hard to have a positive body image, when skinny and “perfect” is what is promoted in media. And even the skinniest and “most beautiful” among us is not enough since most model’s photos are airbrushed and retouched. Models should not be the standard on which we compare ourselves. If only we could see ourselves as the way God created us…a reflection of Him, a person of character and a person with the potential to be loving, kind, unselfish, giving, full of life and love and so much more. If only we could embrace who we are, right here, in this moment, no matter how we look. As well, as accepting our bodies for the way they are, thick, thicker or whatever the case may be, we are also so much more than just external factors. I want you to know: You are so much more than just how you look. Click To Tweet You are a person made up of intelligence, dreams, goals, kindness, love, beauty not only skin deep, laughter, fun, and so much more. Audrey Hepburn said it well when she said: The beauty of a woman is not in the clothes she wears, the figure that she carries, or the way she combs her hair. The beauty of a woman is seen in her eyes, because that is the doorway to her heart, the place where love resides. True beauty in a woman is reflected in her soul. It’s the caring that she lovingly gives, the passion that she shows and the beauty of a woman only grows with passing years. I am a person of great strength and character…full of love and passion to share with the world! Comment below and share with us…How are you embracing yourself today, in this moment? What can you encourage or tell others to help them embrace themselves for who they are and what they look like today? 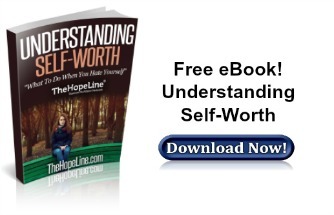 If you need help with embracing yourself just as you are, download TheHopeLine’s eBook: Understanding Self-Worth.